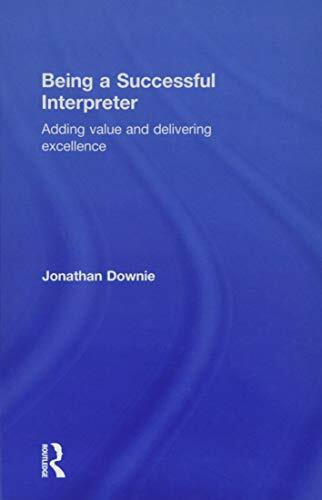 Being a Successful Interpreter: Adding Value and Delivering Excellence is a practice-oriented guide on the future of interpreting and the ways in which interpreters can adjust their business and professional practices for the changing market. The book considers how globalisation and human migration have brought interpreting to the forefront and the subsequent need for interpreters to serve a more diverse client base in more varied contexts. At its core is the view that interpreters must move from the traditional impartial and distant approach to become committed to adding value for their clients. Ideas for group activities and development activities within professional associations. Being a Successful Interpreter is a practical and thorough guide to the business and personal aspects of interpreting. Written in an engaging and user-friendly manner, it is ideal for professional interpreters practising in conference, medical, court, business and public service settings, as well as for students and recent graduates of interpreting studies. Winner of the Proz.com Best Book Prize 2016. Jonathan Downie is a French-English and English-French conference interpreter as well as a researcher, writer and speaker in interpreting and translation. His doctoral thesis at Heriot-Watt University focussed on expectations of interpreters in church settings, which started him on the idea of using research to help interpreters. He regularly writes on the connections between research and practice in translation and interpreting for the ITI Bulletin and VKD Kurier.